Aspiring musicians looking to enhance their music playing experience as well as improve the quality of their songs could achieve this with one of the top models in a MIDI keyboard controller. In fact, MIDI (Musical Instrument Digital Interface) keyboard controllers allow the musically gifted to set up a mini recording studio at home. And although these annotation experts for artists look like any kind of keyboard used in real time, they actually serve a much broader function. Indeed, after connecting what you hope to be the best midi keyboard controller to your computer system, you’ll be able to produce music in a more natural way. The sounds created with our keyboard for music production are generated by computer software installed on our music manager such as virtual instruments (VSTi) and plugins. However, it’s entirely possible to use virtual piano programmes to allow us to play our MIDI keyboard just like a regular piano or electronic keyboard. Of course, It’s important for all members of a band to talk to each other. 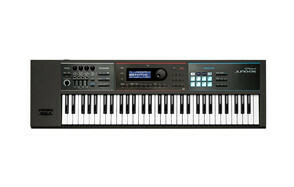 The MIDI keyboard controller allows all musical instruments in your arrangement to communicate via connection to a computer. DAW computer technology allows the musician to have their digital sounds produced and edited professionally. In a nutshell, a smooth-running MIDI keyboard controller is the way forward for musicians aiming to make songs that sound like music should do. And as most performers prefer creating tunes as naturally as possible – playing instruments as opposed to moving a mouse around, buying a top MIDI keyboard controller is the key. Amateur musicians or musical maestros that have always fancied themselves as the next Kraftwerk will have the right tool at hand with this lean, mean music making machine. And with the Akai Professional MPK Mini MKII boasting self-supported operation, it won’t be too long before you have realized your digital music dreams. 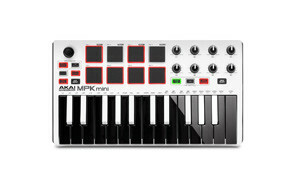 Performers or recording artists of all music genres should seriously consider the attributes of this mini midi keyboard by Akai. But if you think that it’s only the more obvious array of features on this best midi keyboard controller that it’s got to offer, then think again. Indeed, at only 1.65 pounds and built with extreme portability in mind – it’s a nicely compacted design too, this top contender in our comprehensive list of MIDI keyboard controllers is dead easy to take wherever you want to get stuck into your next music creating project. Although the keys are slightly smaller than those on regular MIDI keyboard controllers, once you’ve mastered this aspect – you can focus on organizing your music ideas. If you’re a busy bee, you’ll be pleased with the USB-MIDI interface feature on this MIDI keyboard controller – the process of compiling music is made less time-consuming. This also makes a perfect gift for music lovers. Music makers that appreciate simplicity regarding the features on midi controllers as well as portability will not be left wanting with this 25-key MIDI controller from Korg. And if you’ve a need for speed, the velocity-sensitive keys on this baby will have you wondering why it’s taken you so long to snap up this music data communicator. Perfectionists with aims of making the most of the space they have in their modest home studio should understand why the Korg NANOKEY2BK 25-Key Midi Controller is in second place on our well-researched list. Indeed, easily fitting in this low-profile midi keyboard among a computer setup is another strong selling point for this model. Control freaks will be in awe of the DAW software provided by Korg on this wonderfully-compacted MIDI controller. The eight channels incorporated into this impressive design come with a fader, knob and three switches – this helps the user to create a more natural vibe to the tunes they put together. Musicians that tend to be poorly organised at the best of times could overcome this negative aspect of their music making process with the ability to use a marker button to help note every significant part of the songs they are working on. Indeed, using this top model should help musicians develop as professional music producers. Be sure to combine this with a cool AUX cable from our list. Sci-Fi fans drawn to this option in MIDI controllers could be forgiven for thinking this cutting-edge digital manager looks like something a member of the Star Trek crew may have in their hands. However, not only is this contender in our list of top MIDI controllers far from being science fiction but also a game changer for musicians. Melody makers who went through the whole rave scene saying they don’t like the backlit pad feature on this model are probably being economical with the truth. And just because the Launchpad Ableton Live controller by Novation is bright and cheerful, it doesn’t mean to say that we shouldn’t take it too seriously. Ska music fans serious about recreating some of the more popular beats of this magical era of popular music will be impressed with the features on this model allowing us to mess around with music samples of bygone years. If you’ve embraced the modern dance music genre, tripping the light fantastic will be a pleasure. Of course, music makers with aspirations of making their life much more simple can take advantage of what is a very dainty piece of music communicating gear. At only 1.98 pounds and a mere 9.4 inches in length, stuffing this small and compact MIDI controller into your bag before heading off to a show will become a matter of course. Be sure to also check out our list of the best headphone amplifiers for more great items like this. Although fourth in our much-deliberated buying guide list, this heavyweight in the midi keyboard controller division is not to be disregarded. And if you really don’t have the time or the inclination to mess around with installing or adding software to get yourself up and running, you’ll appreciate the already included Ableton Live Lite Alesis Edition. 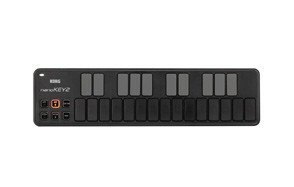 The velocity-sensitive keys on Alesis Q25 25-Key USB MIDI Keyboard Controller combined with pitch and modulation wheels is something else to raise the interests in musical geniuses or amateur producers alike. Artists that value simplicity will like the fact that the USB cable can be used for both data and power transmission. When taking the time to appreciate why we rate this one of the best midi controller options, you’ll be happy to see that it’s earned its merit for a number of reasons. 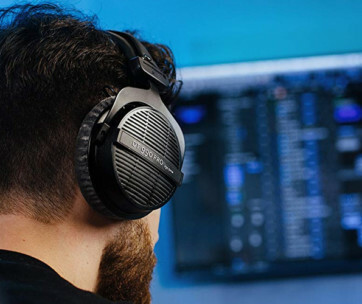 Indeed, The computer-based digital audio makes working with sound for the music projects you’re working on much easier to complete. And even though it’s a bit heavier than most competitors in this list, there’s no need to feel that it’ll be difficult to carry around. 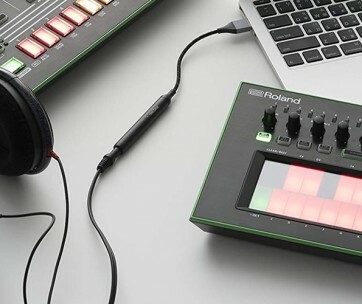 On the contrary, this state-of-the-art MIDI controller is not only comprised of sought after features by professional and casual music makers but also one of the more portable MIDI controllers. 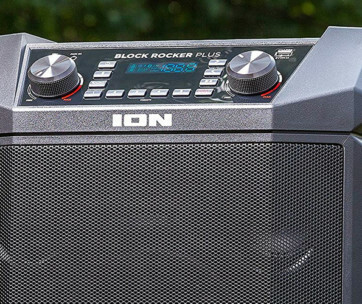 Our handy guide to the best tailgate speakers features more great products like this. As we reach midway through our list of the more desirable options in the best midi keyboard controller, it should become clear that we have put a lot of thought into this listing. As many users of modern MIDI keyboard controllers rely heavily on portability, it’s fair that the mobile M-Audio Oxygen 25 MK IV USB is in contention. .
One of the more appealing features of portable of this 25 key midi controller is the kind of software it comes with. Of course, travelling musicians that don’t have the sort of budget that more established music makers have will want to purchase a midi keyboard with software already installed. And as the M-Audio Oxygen 25 MKIV MIDI Controller includes Pro Tools Lite as well as Ableton Lite, musicians that need to tighten their belt are going to be quids in. The 25 synth-action keys with velocity sensitivity, eight trigger pads and eight knobs easily manipulated to create great sounds makes this a great choice. Pushed-for-time performers will be impressed with the plug-n-play feature on this model – it’s dead easy to get going once you connect your USB lead to your computer. And if you’re an aspiring DJ with plans to blow away your competition, mastering the eight mixing knobs before getting on stage will get you one step closer to your dream. Love this product? Check out our review of the best open back headphones for our top picks. Although not too different to the 25 key model detailed above, this other offering from the leader in MIDI keyboard controllers is almost twice as heavy and considerably longer. That said, the extra keys and additional features on this master of MIDI controllers is what makes it very good value for money. Music virtuosos set on perfecting the unmistakable sounds of The Doors or hoping to give Orbital a run for their money can’t go too far wrong with this usb midi keyboard. In fact, there are many reasons for choosing the M-Audio Oxygen 49 MKIV – the eight assignable knobs for increased mixing capabilities being just one of them. Notwithstanding the extra weight in this popular MIDI keyboard for professional and novice musicians alike, this model is still pretty portable. But as most of us will agree with the notion that practice makes perfect, users of this marvel in MIDI keyboard technology should be patient when attempting to realise their music making goals. Dance music enthusiasts looking for a way to break into their local DJ – ing market are bound to make waves with the eight velocity-sensitive pads provided by M-Audio for this midi keyboard with pads. Indeed, adding a bit of beat to your top tunes will be easy to achieve with the quick-response beat pads on this equipment. Find more great products like this by checking out our guide to the best decibel meters. Fortunately for music producers not all that competent at playing the piano or other keyboards, this one of the best midi keyboard controller around at the moment provides a solution. And as this top model is easy to set up, performers with a lot to learn can get the ball rolling in their quest to become more proficient. Users of Ableton Live software will be delighted with this model – using this technology to enhance the performance of the music they are into. Of course, we don’t need to be involved in just one genre of music to benefit from Ableton Live Lite – the software that comes with this model is suitable for a range of melodies. If you’re amazed at what the likes of Moby or Fatboy Slim have been able to achieve at their live gigs or music they have put together in the studio, getting your hands on one of these beasts should definitely be on your bucket list. And although at number eight in our listing, skills of top DJs could be achieved with the Novation Launchkey. In order to create music that doesn’t sound too much like it’s been generated by a machine, it’s important to appreciate the features on this best midi keyboard. Indeed, the variation of the notes and chords to make the music sound more natural is just one of the things that sets this keyboard controller apart from its competitors. Don’t forget to also check our guide to the best headphone amplifiers. If you believe that a bad craftsmen shouldn’t blame their tools for a poor job, then you’re probably one step closer to realising why top music producers and performers purchase this equipment to help create perfect tunes. With its chunky and wide backlit pads, it shouldn’t be too difficult for musicians to create the sounds they are after. The built-in feature preventing users from having an unwanted beat after hitting one of the pads shouldn’t be all that hard to master. And the bulky no-nonsense design of Akai Professional MPD218 controller provides musicians with assurance that they’re not going to damage it with over-enthused use. Melody makers constantly on the go in their quest to make out-of-this-world music will be pleased with the simple and compact design of this viable contender in our list. Getting to your next gig or showing up at a pal’s place to show them what you can do with this guy won’t be a daunting task at all – this model is really easy to carry around. Of course, if you look for music making gear that are pleasing to the eye, buying this product from Akai won’t leave you wanting. Its six knobs and six buttons that are user friendly will give you the kind of music creating leverage you were after. You may also like to check our guide to the best soundbars. As most musicians will agree with, preparing for your next gig can be almost as exciting as actually performing at the show. With this in mind, there is no wonder why so many experienced or even novice music performers choose to purchase this fantastic offering from Roland. And it’s not just the fact that users of this magical machine are able to get all their music ideas consolidated and organised properly before a gig but the fact it is lightweight makes it real easy to get to your next music manifest. Moreover, its battery-powered feature allows busy musicians to set up without much delay. The Intuitive eight-track pattern sequencer with unhindered recording facilitates a more rapid development in the songs you’re working on. By all accounts, this master in the best midi keyboard controller is a must for musicians and music producers that want to get ahead in their game. Users of Roland Lightweight will also be able to make use of the very handy wave expansion slot whichprovides you with the option of downloading an array of new sound waveforms without costing you a single penny – how’s that for great value for money! Music composers that are more likely to search for a public space to get into some tune making won’t want to overlook this portable model. With its 24 keywave feature and two octave playing surface, music makers who love the freedom of doing their stuff wherever they want to have found the perfect solution with this Seaboard. The soft surface of this leader in the more simplified versions of midi controller allows users to experience a more subtle way of putting together tracks they have been working on of late. And as you’ll be able to play a whole spectrum of sounds from instruments, the sky really is the limit with this compact melody maker. Musicians that could do with a little inspiration are going to be well pleased with the many free sounds that are part of this offering from ROLI. The software included in the ROLI Seaboard Block such as Equator Player, NOISE, BLOCKS Dashboard and the ever popular Ableton Live Lite as well as MaxMSP is another positive aspect. By taking the plunge with this top boy in the world of Seaboard devices, it won’t be all that long before you’ve realised you have made the right choice for these inspirational music creating machines. The 5D Touch technology that it comes with is another fantastic feature of the ROLI Seaboard Block.